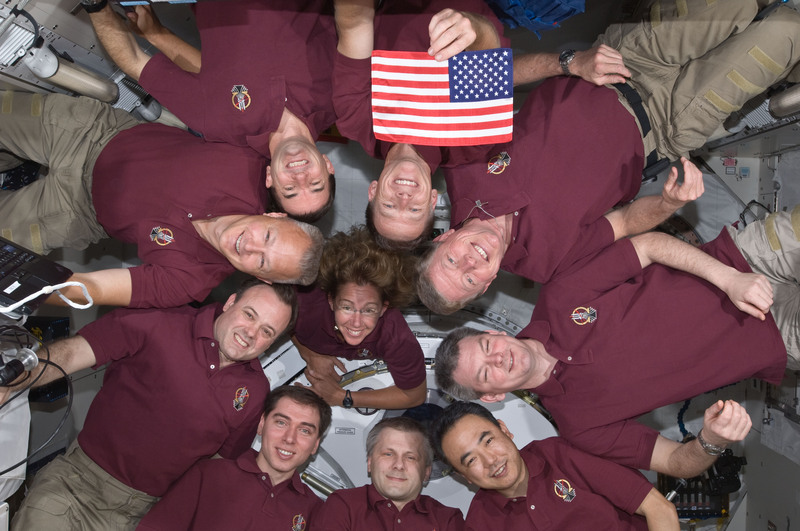 When Chris Ferguson commanded the final space shuttle mission in July 2011, he and his crew members left behind something on the International Space Station: a small American flag that had flown on the first shuttle mission three decades earlier. “It will hopefully maintain a position of honor until the next vehicle launched from U.S. soil brings U.S. astronauts up to dock with the space station,” Ferguson explained in a call with President Obama during the mission. “I understand it’s going to be sort of a ‘capture the flag’ moment here for commercial spaceflight,” Obama responded. As the director for crew and mission operations at Boeing, Ferguson is one of the leaders of that company’s effort to develop and operate a spacecraft to carry NASA astronauts to the space station—and capture that flag. Boeing is competing with SpaceX for that privilege, and both are racing the clock to get those vehicles flying before a NASA contract with Russia runs out. Much more than scheduling is at stake. If spaceflight can escape the hothouse of government contracting to become a truly commercial enterprise, price competition may at last bring costs down to earth. And 2017 may see some crucial steps taken along that path. NASA’s Commercial Crew Program dates back a decade, when the agency began helping aerospace companies to develop commercial cargo vehicles. Rather than doing this under a typical government contract, with NASA designing the spacecraft and a contractor building it, NASA sought to have the companies create spacecraft on their own. NASA would provide financial and technical support, and the agency would later buy cargo-delivery services rather than purchase the spacecraft themselves. That effort, known as Commercial Orbital Transportation Services (COTS [PDF]), included an option to provide ferry services for crew. Although SpaceX described how it could satisfy that option in its COTS proposal, NASA chose not to select it, deciding to focus on the cargo services it knew it needed once the shuttle retired. Under the COTS program, SpaceX and Orbital Sciences Corp. (now Orbital ATK) both eventually developed vehicles, which are now transporting supplies, experiments, and other equipment to and from the station. As part of a broader shake-up of the agency’s plans for human spaceflight, NASA announced in 2010 that it was moving ahead with development of crew transportation systems using the same approach as it did with COTS. The agency made a series of awards to several companies, including Boeing and SpaceX, to support early development of key technologies for those vehicles. In September 2014, NASA issued the final set of contracts to Boeing and SpaceX—contracts with a combined value of US $6.8 billion. Besides completion of the vehicles, those contracts also include two test flights for each company, one with and one without a crew, and as many as six missions each to ferry two people at a time to and from the station. And both companies have been hard at work. Boeing’s CST-100 spacecraft, called the Starliner, and SpaceX’s Crew Dragon spacecraft, a.k.a. Dragon v2, look remarkably similar. Unlike the shuttle, both are capsules that will launch atop rockets. Both are designed to carry up to seven people, although NASA anticipates sending only four at a time; the companies may use the additional seats for other, commercial missions. There are, however, considerable differences. The CST-100 will launch atop an Atlas V from United Launch Alliance (a joint venture of Lockheed Martin and Boeing). This same rocket has flown some 60 consecutive successful missions since its introduction in 2002. “It’s not unlike a stock Atlas V,” Ferguson says of the CST-100’s launch vehicle. The rocket will feature a few differences, such as the use of an upper stage with two engines instead of one, and the addition of a system to detect imminent failures, which will be linked to the capsule’s abort system, allowing it to escape in the event of a problem. On its return to Earth, the CST-100 will go where no NASA capsule has gone before: dry land. While the Mercury, Gemini, and Apollo capsules all splashed into the ocean, the CST-100 will touch down on land, using retrorockets, parachutes, and airbags. That strategy is important for Boeing because it intends to reuse each CST-100 spacecraft up to 10 times. “We felt we really needed to land on land to get reusability,” says John Mulholland, Boeing’s CST-100 program manager. Splashing down in the ocean, he says, creates problems, such as salt water getting into the capsule and corroding components. Your Pizza, Captain: Boeing’s CST-100 will touch down where no NASA flight has ever gone: dry land. In addition, touching down on land makes it easier and faster to reach the crew, using trucks and helicopters, much as Russia does on its Soyuz landings. Unlike Boeing’s capsule, SpaceX’s Crew Dragon will launch on a rocket of the company’s own design, the Falcon 9, which has flown nearly 30 times since entering service in 2010. A Dragon cargo spacecraft failed during a launch, and a Falcon 9 exploded on the launchpad this past September. The Dragon spacecraft itself, however, has performed well on its cargo missions to the International Space Station. Moreover, SpaceX designed the Dragon from the beginning to be capable, with modification, of carrying people as well as cargo. “A big difference between Crew Dragon and the cargo Dragon is that we’ve added these ­SuperDraco thrusters,” says Benjamin Reed, director of crew mission management at SpaceX. Those thrusters, mounted on the side of the capsule, will serve as the abort system for the spacecraft. The company tested this equipment in May 2015, when a Dragon capsule flew off its Florida launchpad using only its SuperDraco thrusters, splashing down a short distance offshore. But SpaceX has additional plans for those thrusters. Initial Crew Dragon missions will splash down in the ocean, just as the cargo version of Dragon does today. According to Reed, splashdowns shouldn’t prevent the capsule from being reused. “Our team has some of the world’s experts in parachute landing and water recovery,” he says. SpaceX plans to start reusing the cargo version of the Dragon spacecraft in the coming year. The two companies run their programs differently. Boeing makes extensive use of partners. It is leasing a hangar at the Kennedy Space Center previously used to refurbish space shuttles, turning it into an assembly plant for CST-100 capsules. Boeing also hired NASA’s Mission Operations Directorate, which runs the iconic Mission Control Center in Houston, to take on a similar role for ­CST-100 flights. SpaceX, on the other hand, is doing just about everything itself. It’s building both the capsule and rocket, and it will also handle mission control for its crewed missions, using a facility at its headquarters in Hawthorne, Calif., which currently runs cargo Dragon missions. Flying Our Way: SpaceX built both the Crew Dragon capsule and its rocket alone, without partners. Since NASA awarded contracts to Boeing and SpaceX in 2014, both companies have been busy developing their respective spacecraft. That work has included parachute and other landing-system demonstrations, SpaceX’s pad abort trial in 2015, and various other tests. But schedules have slipped. NASA originally hoped to have commercial crew vehicles ready to fly by the end of 2015. Spending cuts by Congress, though, prompted both by skepticism about the program as well as tightening budgets, pushed that target to the end of 2017. And this past September NASA’s Office of Inspector General warned [PDF] that more delays were likely. The problem was no longer caused by money issues—Congress was now fully funding the program—but by technical ones. “Notwithstanding the contractors’ optimism, based on the information we gathered during our audit, we believe it unlikely that either ­Boeing or SpaceX will achieve certified, crewed flight to the ISS until late 2018,” the report concluded. When the report came out, Boeing’s schedule had already slipped by a few months, with a crewed test flight planned for early 2018. “We’ll be ready for flight services by the middle of 2018,” Ferguson said in mid-September. A month later, Boeing announced it was delaying its schedule by half a year. That crewed test flight, previously planned for February 2018, is now scheduled for August 2018, with the first operational mission expected in December 2018. Boeing blamed the delay on problems with aerodynamic loads on the Atlas V created by the CST-100 capsule, as well as other snafus. “We’ve gone through a lot of hurdles on our technical development,” Mulholland said in mid-October, after Boeing announced the schedule change, adding he was optimistic that the company could keep to the new schedule. SpaceX has been more circumspect about its timetable. This past July, according to official NASA schedules, the company said it planned to carry out an uncrewed test flight of its Crew Dragon in May 2017, followed by a crewed test in August 2017. That schedule, though, predated the Falcon 9 pad explosion that is delaying many missions, including those test flights. And in mid-December, NASA announced that SpaceX was delaying its uncrewed demonstration flight until November 2017 and its first crewed flight until May 2018. So no astronauts will fly in the coming year. NASA is feeling the pressure. It needs to have at least one company ready to start flying astronauts to the space station by the end of 2018, when its contract to use Russia’s rockets for those flights expires. Extending the contract with Russia is not an option, says William Gerstenmaier, NASA associate administrator for human exploration and operations. “They require a three-year lead time,” he says, meaning it’s too late now to purchase seats on Soyuz flights for missions in early 2019. Will Boeing and SpaceX be ready to fly by the end of 2018? “It’s still feasible,” Gerstenmaier says. The future of the station depends on one or the other capturing that flag. The commercialization of spaceflight requires that both companies, and others besides, join the fray.